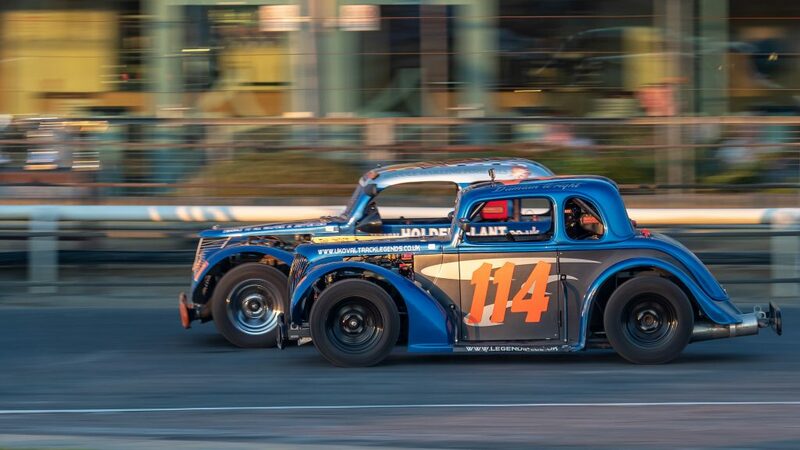 This weekend was a double-header in the UK Oval Track Legends series, with a visit to Ipswich, our local track, on Saturday evening followed by Yarmouth, an hour or so up the coast on Sunday evening. As both races were evening meets, and we’re enjoying some unprecedented sunny weather in the UK at the moment, I thought this might be a good opportunity to get some special photos, and I wasn’t wrong! Here are my pick of the bunch from the weekend, all of which I’m very proud of because I believe they represent pretty much everything I’ve been trying (and struggling) to achieve since I got into this photography lark! 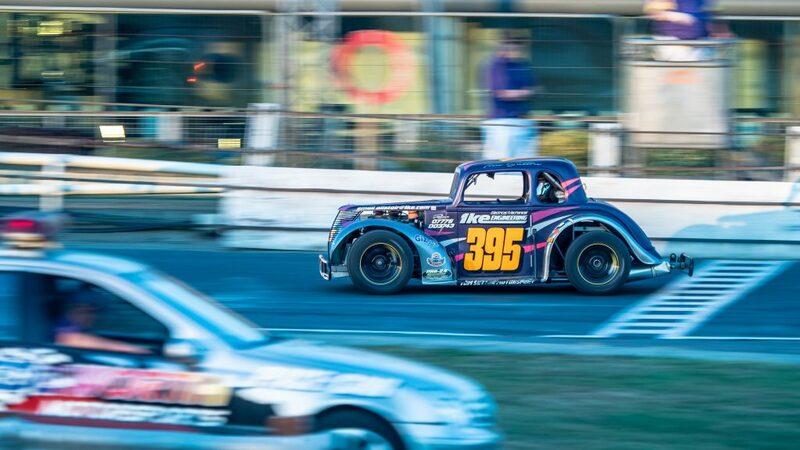 This image is car #395 Tom Sutton, a beautifully presented purple car with excellent signage, driven by a great driver who’s achieving some success currently in Legends, finishing 2nd in the featured race of the day, the East Anglian Championship. In this image the car is in sharp focus and everything else isn’t, the perfect panning shot, but also the colours in the background (track staff in purple tee-shirts etc.) sets it off beautifully in my opinion, and there’s some foreground interest as well to fully emphasise the fact the car is moving at speed. 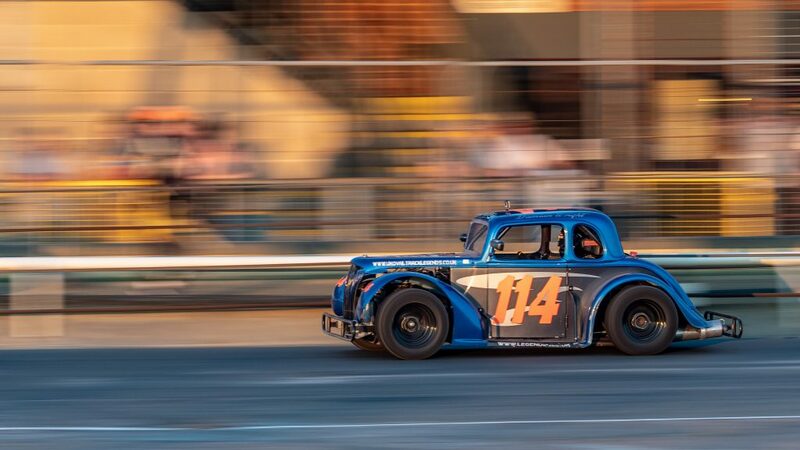 In this image, of my step-son Damian in his car #114, the orange numbering on the car is picked up by the orange seating in the grandstand behind, and the low shutter speed creates horizontal lines from the catch fencing, track barrier and surface to highlight the movement of the car as it speeds down the home straight. 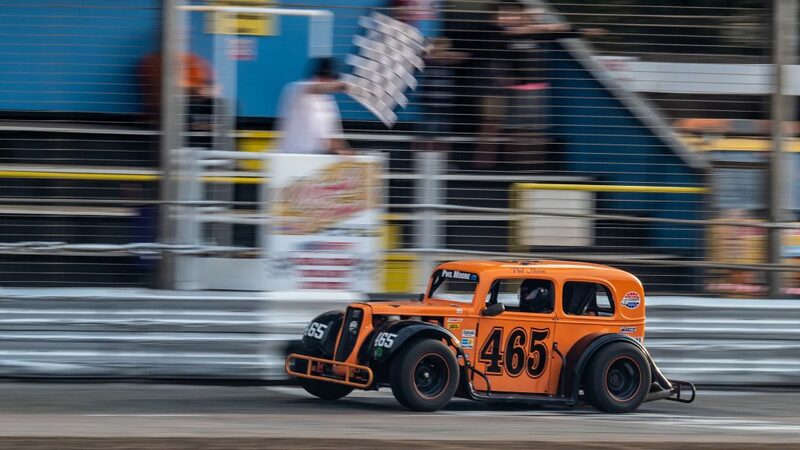 This one is from Saturday’s race, and although I’m pleased with it for the sheer fact it works as a panning shot, again with the car in perfect focus, it also captures a “moment”, this is the winning car, #465 Phil Moore as he crosses the line, indeed it’s the very moment he crosses the line as can be seen from the (admittedly faint) white line across the track marking the start / finish. The background is blurred enough to convey a sense of speed, but not enough that you can’t make out the man waving the chequered flag. Finally this is my favourite image of the lot, and possibly the best photo I’ve ever taken. Here the nearest car #114 (Damian) is in perfect focus, the car behind is #161 Dan Holden, Damian’s very close friend and currently the best driver in the Legends formula. In the background is the new Bar / Restaurant at Yarmouth stadium which has a large tinted glass frontage (the stadium also hosts Greyhound racing). The glass reflects back the cars and the warm summer evening colours and is blurred sufficiently to provide a creamy, almost abstract, canvas to fully exploit the sharp detail on the car. Perhaps somewhat biased as I know and love both the drivers involved, but even so this is my current favourite picture of all time, or at least until the next time I’m out with my camera and these beautiful cars!